This is the last Mac News Review of the year - Low End Mac will be closed from Christmas through New Year's Day. We'll be back with more Mac news in two weeks. We wish you and yours a joyous Christmas and a blessed 2008. "If the high price tag for Apple hardware has kept you from buying a Mac but you're willing to roll up your sleeves and get adventurous, you can build your own 'Hackintosh' - a PC that runs a patched version of OS X Leopard. What? !, you say. Apple's move to Intel processors in 2006 meant that running OS X on non-Apple hardware is possible, and a community hacking project called OSx86 launched with that goal in mind. Since then, OSx86 has covered major ground, making it possible for civilians - like you and me! - to put together their own Hackintosh running Mac OS 10.5. Today, I'll show you how to build your own high end computer running Leopard from start to finish for under $800." "Most consumers seeking a new computer this holiday season will buy a Windows PC. And yet judging by the questions I get, many would-be buyers are considering a Macintosh for the first time, possibly because they're smitten with the iPod, or because of Apple's clever Mac guy/PC guy TV ads. "It's like explaining the difference between a Buick and a BMW...."
"The launch of Apple Inc's latest operating system, Leopard, was its best ever, a research group said on Monday. "When comparing the first full month of sales of Apple Mac OS 10.5 'Leopard' (November 2007) to the first full month of sales for Mac OS 10.4 'Tiger' (May 2005), dollar volume for Leopard was up 32.8 percent and unit volume up 20.5 percent, NPD Group Inc said in a statement." "And FireWire - even FireWire 400 - is generally faster in operation than 480 Mb/s USB 2.0...."
"There's no word on when S3200 devices might hit the market, but the 1394 Trade Association expects the standard to be fully ratified by early February. That's well ahead of USB 3.0, the closest competition to the spec...."
"Of course, FireWire - up to and including S3200 - has always offered certain advantages that USB lacks. Not only is it markedly less CPU-intensive due to its peer-to-peer nature (USB is master/slave), but FireWire is capable of delivering more power over a single cable." Editor's note: The USB specification has always limited the bandwidth used by any single device to 2/3 of maximum bandwidth. Thus a USB 1.1 drive can only transfer data at up to 8 MB/sec., USB 2.0 at 320 Mb/sec., and the proposed USB 3.0 at 3200 Mb/sec. - the same as the FireWire's S3200 proposal. "Whether you are an Apple Inc. fan or not, you have to give them some sugar. They are one of the leading figures in turning their product into a company, their company into a brand, and finally their brand into a cult with diehard followers willing to pay the premium pricing. "Have you ever seen a sale at an Apple Store? "The answer is probably not. "Yet still, they are growing more rapidly than any other computer company on the market. Why?" "I need a new computer. "So readers, Mac or PC? "The thing is Mac users sometimes scare me just a little . . . Really. It's as if they've been converted to the Church of Macintosh. Has anyone else noticed this phenomenon?" "Mac users generally strike me akin to missionaries. I've recently dubbed them the 'Cult of Apple'. Why? Well, it's not enough that they love the camera, the screen, the bubbly icons at the bottom of their desktop that pop up when scrolled over . . . but what troubles me most is that after a glorified demonstration - they're convinced I too must love-borderline-worship 'M-c'. And if I don't, they'll make darn sure I'm converted before I leave. I've actually had to fake it one or two times just so I could go." Editor's note: It appears that the term "Church of Macintosh" was first used online by Rodney O. Lain in 2001 when he wrote The 10 Commandments of the Church of Macintosh, Part I and Part II. "Users running Intuit Inc.'s Apple Macintosh version of QuickBooks Pro 2006 and 2007 today were warned that an automatic software update flaw can eradicate stored files, documents or folders from a desktop and hard drive. "Intuit late this morning said it had fixed the flaw by correcting an internal server that had caused the problem. The company said the message should no longer appear to users opening up the QuickBooks application. "Intuit said it has not been able to come up with a resolution to allow end users to recover files that were lost as a result of the problem...."
PR: FastMac has announced a 4x Dual Layer Blu-ray optical drive upgrade for Apple's Mac Pro & Power Mac G5 computers. The new 5.25", tray loading drive uses one of the fastest Mac-compatible Blu-ray mechanisms to provide up to 50 GB of storage on 1 dual or double layer disc, without sacrificing compatibility with standard DVD & CD recordable media. Using a SATA connection, the drive's 4x BD-R DL mechanism allows professional Mac users to burn up to 50 GB of data on 1 disc in less than 50 minutes. FastMac's 4x Blu-ray optical drive upgrade is available now, and can be ordered from fastmac.com for a special introductory price of $579.95. Each drive carries a 1-year warranty and a 30-day money back guarantee. FastMac's line of Blu-ray recordable drives give photographers, videographers & musicians the ability to save large amounts of data in a compact and portable form factor, ideal for separating production files by clients and/ or project. System and database administrators can archive and retrieve large amounts of data on 1 convenient disc. In addition to broad support from the electronics, music, computer & video game industry, 6 out of 8 of the major Hollywood film studios support Blu-ray media and 5 out of those 6 (Disney, Fox, Lionsgate, MGM & Sony) have decided to release their movies exclusively in the Blu-ray format. Recently released data (based on unit sales of players & movie titles) shows Blu-ray movie titles outselling HD-DVD titles by a ratio of 3:1. The Blu-ray format also dominates the recorder market in Japan, where it holds a 97% market share lead over HD-DVD. With its forward and backward integration with new and old media, Blu-ray is destined to become the successor to today's DVD format. FastMac's 4x Blu-ray optical drive upgrade supports reading & writing to single and dual layer Blu-ray media at 4x speeds, and rewriting to single and dual layer Blu-ray media at 2x speeds. The drive is also compatible with standard DVD and CD media and can write to DVD-R and DVD+R media at 12x speed in single layer and 8x speed in dual/ double layer mode. 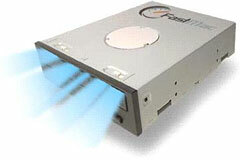 It can rewrite to DVD+RW media at 8x speeds and DVD-RW media at 6x speeds. The drive also supports CD-R reading and writing at up to 40x speeds and CD-RW burning at up to 24x speeds. Blu-ray burning requires Blu-ray media (sold separately) & third-party software such as Adobe Premiere CS3 or Roxio's Toast 8 Titanium, which enables Blu-ray disk support in the Mac OS Finder. Native support for Blu-ray burning within iLife & iTunes is expected in the near future, but cannot be guaranteed at this time. PR: CrossOver Mac allows you to install many popular Windows applications and games on your Intel OS X Mac. CrossOver includes an easy to use, single click interface, which makes installing Windows software simple and fast. Once installed, your application integrates seamlessly in OS X. Just click and run your application directly from the OS X Finder. Clicking a Windows file or document - including email attachments - will launch the appropriate Windows program, allowing you to work on the files. Best of all, you do it all easily and affordably, without needing a Microsoft operating system license. Fixed a crash with certain non-US keyboards. Fixed a small GUI error which appeared when creating new bottles for supported apps. Fixed a potential hang-on-exit problem. Fixed transparent and incorrectly colored cursors. Extended the Team Fortress 2 font fix to Half-Life 2: Episode 2 and Portal.